I don't usually print halftones from newspapers, but this one has a good story. I went to WAAAM this weekend and watched Dale struggling to keep their newly restored 1907 Everybody's Motor Car running. They told me it is believed to be the first automobile in the Dalles, which seemed like something a visit to the ODNP archives should resolve. When searching this archive it's best to cast a wide net, so I looked for all mentions of automobiles in the 1907 newspapers from Hood River and the Dalles. 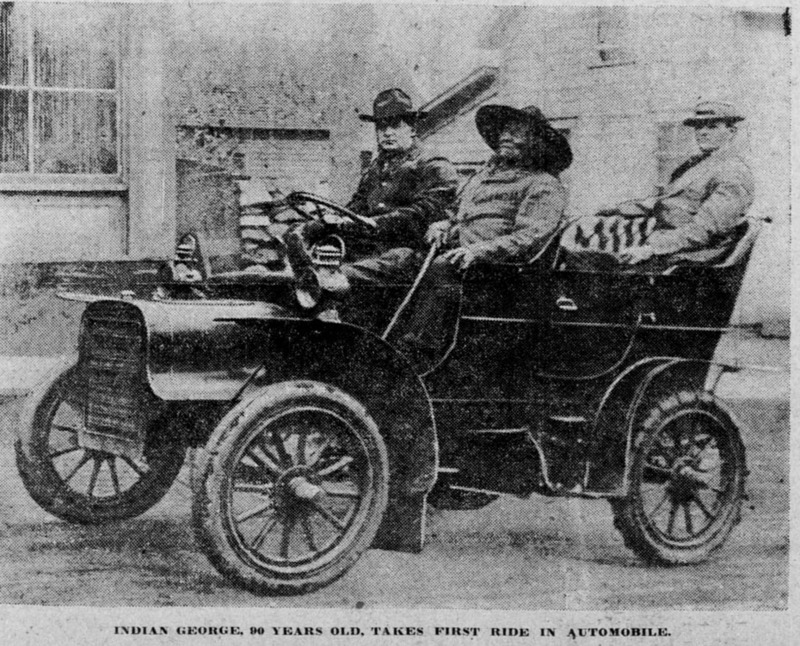 I learned by August 1907 there were five automobiles in Hood River, and I learned that Clarence Gilbert's picture of himself giving "Indian George" his first ride in an automobile had been published in the Sunday Oregonian. And sure enough, here it is. Clarence Gilbert gave Indian George the ride of his life in the automobile Monday. It took a great deal of persuasion to got the old man in the devil wagon, but after be got over his first uneasiness be appeared to enjoy the ride and said he liked it "heap good." He took no chances, however, and hung onto the seat for dear life, while his long hair streamed back in the wind. I also learned that you could take a 17 mile tour of the Hood River valley by automobile for $1.50, and that shortly after Merrill Gessling got his automobile he seriously injured the tendons in his hand when it backfired while he was cranking it. And Dr. Dumble was selling his horse cheap on account of it being afraid of automobiles. And what did I learn about the first automobile in the Dalles? Nothing yet. The Dalles newspapers from 1907 are not yet digitized, so my search only returned references from Hood River. Guess I have to get to work getting the rest of the Dalles newspapers digitized. At least George didn't have to worry if Gilbert lost control, as George was blind by then. Clarence Gilbert was a native of Ohio, having been born there in 1883. He came to H.R. with his parents, Clifton and May Gilbert. In his early years he clerked at one of the hotels and then later was in retail merchandising. I know my great-grandfather had one of the very early automobiles in H.R. but don't know the year he got it. Moved to Siletz right after the war when 5 years old. Dad had won $200 in a poker game on the troopship coming home from Japan. Bought an old cat.and started logging for Monroe Lumber Co. At that time every Indian, including children, received $1,000 from the govt. at the same time every year. The narrow winding road between Siletz and Toledo was not safe to drive on. Took about two weeks for all the new cars to be wrecked. By the time I moved to Hood River 10 years later, the vast majority of Indian men had become hard working loggers-damn good men. Bought big Buicks and Hudsons. I'm not saying all loggers became saints, but through hard work families were able to become part of the middle class. Sadly today, most of the jobs are gone-alcohol and drugs are a serious problem. For the most part, women are in charge of the reservation and the casino in Lincoln City. And doing a good job of it. Thanks, Arthur! The fact that there were five cars in HR in 1907 is a fun fact to put into the historic walking tours of downtown Hood River, which begin on Monday the 18th. Along these lines, do we know when the first bridges were built where the State Street and Tucker bridges now stand (or nearby)? I believe I saw a reference to a bridge across the lower Hood River as early as the 1880s but don't remember where I saw it. Thanks for the fascinating research. We often chuckle that now, if you attend a gathering for an Indian function, instead of wagon loads of Indians showing up, it will be van loads. Do my eyes deceive me or are the rear wheels smaller than the front? And they must have been the first heavy tread tires to get through the mud or the unpaved roads. Devil wagons! That's how I'm going to start referring to the weekend traffic backups downtown. I was curious when the first car arrived in the Yakima Valley. Lots of flat ground to drive on, but it couldn't be easy to get a car there. Maybe by railroad. I found out there is a book written by Rosco Sheller. "Me and the Model T." His first ride was in 1915. I have read other history books by Mr. Sheller. He is a good author. I didn't know about this book.